Yasmin Alibhai-Brown is a world acclaimed journalist who has written for The Guardian, Observer, The New York Times, Time Magazine, Newsweek, The Evening Standard, the Mail and other newspapers and is now a regular columnist for The Independent. Yasmin is a weekly columnist for the i and a Guest Columnist for the Sunday Mirror. She is also a radio and television broadcaster and author of several books and co-creator of a new style of cuisine – see more at www.afrasian.tv. 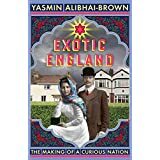 Her latest book is Exotic England: The Making of a Curious Nation – where she paints a sumptuous and illuminating portrait of who the English have been and brings a fresh, invigorating perspective on what ‘Englishness’ really mean. Read what they say: – Provocations is a groundbreaking new series of short polemics composed by some of the most intriguing voices in contemporary culture and edited by Yasmin Alibhai Brown. Never less than sharp, intelligent and controversial Provocations is a major new contribution to some of the most vital discussions in society today. Published by Biteback Publishing. She has been voted one of the top ten most powerful Asians in Britain and one of the most influential voices on the left. Her latest book is entitled Exotic England. She was awarded a Winston Churchill Travel Fellowship to research the book. In May 2011, she was invited to speak at a prestigious TED salon in London and described the theme of her new book to a surprised and very interested audience. In January she took up a part-time post as Professor of Journalism at London’s Middlesex University. Her book, No Place Like Home, was well received by critics, was an autobiographical account of a twice removed immigrant. From 1996 to 2001 she was a Research Fellow at the Institute for Public Policy Research which published True Colours on the role of government on racial attitudes. Tony Blair launched the book in March 1999. She is a senior fellow at the Foreign Policy Centre. In 2000 she published, Who Do We Think We Are? published in the US too, an acclaimed book on the state of the British nation and another book, After Multiculturalism which looks at the globalised future. Yasmin advises various key institutions on race matters. She is also a regular international public speaker in Britain, other European countries, North America and Asian nations. She is a diversity adviser to global companies and organisations. She is a governor of the Royal Shakespeare Company and is on the board of Metal, an innovative arts organisation headed by Jude Kelley who runs the South Bank Centre in London. She is a trustee of Dash Arts set up by the acclaimed theatre director Tim Supple. Yasmin came to the UK in 1972 from Uganda after completing her undergraduate degree at Makerere University where she was awarded an exceptional first class degree in English. She went to Oxford as a post-graduate student and was awarded an M.Phil in literature in1975. In 2001 came the publication of the paperback of Who Do We Think We Are? and Mixed Feelings, a book on mixed race Britons which has been praised by all those who have reviewed it to date. In June 1999, she received an honorary degree from the Open University for her contributions to social justice. She is the President of the Institute of Family Therapy. In 2001 she was appointed an MBE for services to journalism in the new year’s Honours list, a medal she returned in 2003 as a protest against the illegal war in Iraq. In 2002 she was awarded the prestigious George Orwell prize for political journalism. In July 2003 Liverpool John Moore’s University made her an Honorary Fellow. In September 2004, she was awarded an honorary degree by the Oxford Brookes University . In April 2004, her film on Islam for Channel 4 won an award. In September 2004, a collection of her journalistic writings, Some of My Best Friends Are was published by Politicos. In 2005/6 she went on stage with her one woman show, written and performed by her, which was commissioned and directed by the Royal Shakespeare Company as part of their new work festival. In 2006 the show had two London runs and went to other locations. It was highly praised by the Times, Independent and critics. In 2007 the show was taken to India – to great acclaim. In 2007, she was appointed Hon, Visiting Professor in Journalism at Cardiff University. In that same year she started up a charity- Muslims for Secular Democracy to promote democratic values among young British Muslims. In 2008, she was appointed Visiting Professor of Journalism at the University of Lincoln and Visiting Professor at the University of the West of England. In 2008 she was awarded an honorary doctorate by York St John University. Her new book, The Settler’s Cookbook, a food memoir on East African Asians was published in the spring of 2009 and was book of the week on BBC Radio4. It has been described by critics as ‘groundbreaking’ ‘wonderful’ and ‘elegiac’. From 2005 to 2012, she was on the diversity and inclusion council of the global pharma company Novartis. She has written extensively in articles and books about health and race, health and exclusion and health and diversity. In 2013 she was appointed co-chair of a major project led by the Centre for Patient Safety and Service Quality set up by Imperial College and Trust. In the same year she took up a part time Professorship in journalism at Middlesex University.